With Befree4iPhone you can remote control your PC and watch the files directly from your Apple iPhone. Only with this software and with your iPhone is it for the first time possible to remote control your PC in a mobile way all over the world in an easy way. 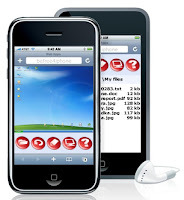 Just install Befree4iPhone on your PC and you will get full access by the safari browser on your mobile phone. You will see the complete PC screen, full zoom - and access ability. Perform all kind of mouseclicks and send texts and key combinations to the PC. Befree4iPhone is freeware. You are able to use all functions mentioned above over an unlimited amount of time! Optionally, you can upgrade Befree4iPhone to the pro-version. In this version you have unlimited access to the pro-features. That is, for example, the included file browser for access to all files stored on your hard disk or local network by your iPhone. You can directly watch supported files like Acrobat PDF or Office files directly on your iPhone without opening them on your PC. Also Befree4iPhone includes a text editor, for editing large texts with your iPhone keyboard - ideal for answering e-mails and editting text files. Befree4iPhone runs on all Windows Platforms since Windows 98 including Windows Vista. Install Befree4iPhone only on your PC. There is no installation necessary on your iPhone. Therefore you do not need a "Jailbreak" or something.